Written by Chrisna on 10 May 2011 . Written by Chrisna on 03 May 2011 . Written by Gary Goldstein on 18 February 2011 . 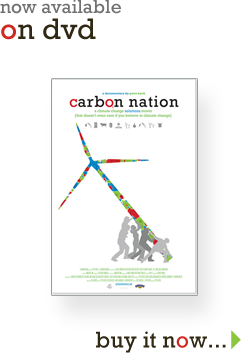 Although it contains its moments of doom and gloom about the potential effects of climate change, the excellent documentary "Carbon Nation" is an inspiring look at the many recent advances in clean energy and green technologies. Director Peter Byck covers an impressively wide range of ground within his film's compact running time as he introduces us to a stirring cross-section of pioneers, researchers and innovators committed to helping the world reduce its carbon footprint. Byck hopscotches across America and beyond interviewing such notables as Richard Branson, former CIA Director R. James Woolsey, Earth Day founder Denis Hayes and charismatic environmental advocate Van Jones, among many others, who weigh in on the issues, problems and solutions surrounding the climate change phenomenon. The world's largest wind farm, a refrigerator recycling plant and a green initiative project for low-income neighborhoods are just a few of the many ecology boosters — and job creators — that get a big-screen close-up here. That Byck's script (written with Eric Driscoll, Matt Weinhold and Karen Weigert) and journalist-TV host Bill Kurtis' narration remain positive, proactive and gingerly apolitical should help widen the film's viewership tent. As New York Times columnist Thomas L. Friedman so aptly puts it here, "Green is the new red, white and blue." "Carbon Nation." No MPAA rating. Running time: 1 hour, 22 minutes. At Laemmle's Sunset 5, West Hollywood. Written by William Schlesinger on 07 December 2010 . 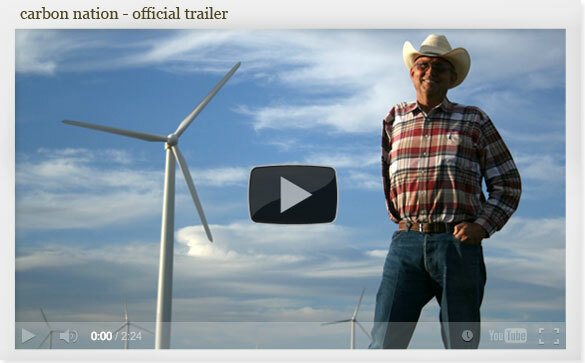 If you’re depressed that the U.S. Senate failed to act on a climate change bill last summer, and that action seems even more unlikely when the new Congress convenes late in January, you’ll want to take a look at Peter Byck’s optimistic new film, Carbon Nation, which opens in New York on February 11. We had a chance to show a pre-screening to a local audience at the Cary Institute of Ecosystem Studies in Millbrook, New York last month. Carbon Nation doesn't waste time arguing that climate change is real and caused by humans, the film steps right into what can be done about it. The main theme -- that it makes simple, good business sense to use energy more efficiently and to find alternatives to fossil fuels -- is developed on economic arguments. Fossil fuels are getting more expensive and we must find alternatives. When evaluated on basic economics, the new fuels are nearly always renewable energy sources.